Directed by Robyn Van Swank and Nick Plotquin, “The Shining Lamp of God” is full of graphic images, bringing to life the internal struggles and demons that the song’s lyrics tackle. The new Mortiis album “The Great Deceiver” will be out March 4th worldwide. Pankow sees 'Throw Out Rite' (1983) re-released on white / black vinyl plus extended CD set feat. 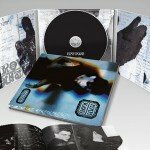 Blixa (of Einsturzende Neubauten fame) - pre-order now!